All work on batteries requires specialist knowledge. The battery is virtually maintenance-free. It is checked as part of the Inspection Service. We recommend that you replace a battery once it is older than 5 years. When an airbag is triggered, the battery will, under certain circumstances, be disconnected from the on-board power supply for safety reasons ⇒ in “General notes on airbag system” on page 201. If the battery is disconnected, some of the vehicle's functions will become inoperative (e.g. electric windows). These functions will require resetting after the battery is reconnected. For this reason, the battery should only be disconnected from the vehicle's electrical system when absolutely necessary. If you do not drive your vehicle for a period of several days or weeks, the power management will gradually shut off the on-board systems one by one, or reduce the amount of current they are using. This limits the amount of power consumed and helps to ensure reliable starting even after a long period. Please note that certain convenience features, such as the Audi advanced key*, the remote control key or the electrical seat adjustment may not be available when you unlock the vehicle. These functions will be restored when you switch on the ignition and start the engine. At low temperatures the battery has to work very hard. It also provides only a fraction of the starting power it has at normal temperatures. For this reason, we recommend having the battery checked and charged if necessary before the start of winter. • All work on batteries requires specialist knowledge. For queries regarding the vehicle battery please contact an Audi dealership or other qualified workshop (risk of chemical burns / risk of explosion). • The battery must not be opened. Do not attempt to make any changes to the electrolyte level of the battery. Otherwise, there is a risk that a mixture of oxygen and hydrogen gas can accumulate and cause an explosion. If the vehicle is to be left standing for a period of several weeks at extremely low temperatures, the battery should be removed from the vehicle. This ensures that it cannot “freeze up” and be damaged. The vehicle battery is located under the floor panel in the luggage compartment. Always be aware of the danger of injury and chemical burns as well as the risk of accident or fire when working on the battery and the electrical system. • Wear safety glasses. Do not allow acid or lead particles to come into contact with eyes, skin or clothing. • Battery acid is extremely corrosive. Wear protective gloves and safety glasses. Do not tilt the battery - acid can leak out of the vapour vent. If electrolyte should splash into the eyes rinse at once for several minutes using clear water. Then seek medical care immediately. Neutralize any acid splashes on the skin or clothing with soap solution, and rinse off with plenty of water. If acid is swallowed by mistake, consult a doctor immediately. • Keep open flames, sparks, uncovered lights and lit cigarettes away from battery. Avoid sparks (including those from static charges) when handling cables and electrical equipment. Never cross the battery poles. The resulting high-energy sparks can cause injury. • A highly explosive mixture of gases is given off when the battery is under charge. Only charge battery in a well ventilated area. • Keep children away from the battery and battery acid. • Switch off all electrical equipment before starting any work on the vehicle electrical system. Remove the ignition key. The minus cable of the battery must be disconnected. When changing a light bulb, it is sufficient to only turn off the light. • Before disconnecting the battery, turn off the anti-theft system! Otherwise, the alarm will sound. • When disconnecting the battery from the vehicle's electrical system, first disconnect the minus cable and then the plus cable. • Before reconnecting the battery, turn off all electrical equipment. First connect the plus cable, then the minus cable. The battery cables must not be connected to the wrong battery poles - serious risk of cable fire. • Never disconnect the car's battery with the engine running or with the ignition turned on, otherwise the electrical system or electrical components will be damaged. • Do not expose the battery to direct sunlight over a long period of time, as the intense ultraviolet radiation can affect the battery housing. • If the car is left standing for long periods, protect the battery from extreme cold temperature so that it does not “freeze up” and become damaged. Terminals for charging the battery are fitted in the engine compartment. – Note the warnings ⇒ in “Important safety warnings for handling a car battery” on page 264 and ⇒ . – Switch off all electrical equipment. Remove the ignition key. – Open the red cap on the positive terminal ⇒ fig. 259. – Follow the correct procedure for connecting the charger cables to the jump-start terminals (terminal with red cap = “positive”, terminal with hexagon = “negative”). – Now connect the battery charger to the mains and switch on. – After charging the battery: switch off the battery charger and disconnect the mains cable. – Now disconnect the charger cables. – Refit the red cap onto the positive terminal. When it is discharged the battery can freeze at temperatures around 0°C. 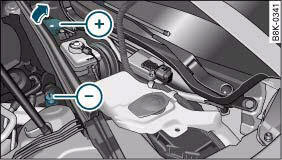 A frozen battery must be thawed before charging ⇒ . However, it is advisable to replace the battery if it has frozen, because the ice can crack the battery casing and allow the battery acid to escape. Important: Before you charge the battery make sure you read the manufacturer's instructions for using the battery charger. When charging with a low current (for instance with a small battery charger) the battery does not have to be disconnected. The battery must not be opened while you are charging it. For technical reasons it is not permissible to fast-charge the battery using charging devices with an output voltage higher than 14.8 V.
Never charge a frozen battery – it could explode. Use only the terminals in the engine compartment to charge the battery. A replacement battery must have the same specifications as the original equipment battery. Your vehicle is equipped with an intelligent power management system to control the distribution of electrical energy. The power management function ensures that the battery is charged much more efficiently than on vehicles without a power management system. For this additional power to be available after replacing the battery, we recommend that the replacement battery used is of the same make and type as the original-equipment battery. The battery must be encoded in the control unit for power management. This has to be done by a qualified workshop. A replacement battery must have the same capacity, voltage (12 V) and current rating. It must also have the same dimensions as the original, factory-fitted battery and have sealed caps. The battery must comply with the standards TL 825 06 (dated December 1997 or later) and VW 7 50 73 (August 2001 or later). • Make sure that the vent hose is always attached to the opening on the side of the battery. Gases or battery acid can otherwise escape and possibly cause damage. • The battery holder and clamps must always be correctly secured. • Before starting any work on the battery, always observe the warnings listed under, “Important safety warnings for handling a car battery”. Batteries contain toxic substances including sulphuric acid and lead. They must be disposed of appropriately and must not be put together with ordinary household waste. Make sure the battery removed from the vehicle cannot tip over. Otherwise, sulphuric acid could escape.